The Gospel of John is considered to be the most metaphysical of the 4 Gospels. Scholars believe that it came from a different source called the Book of Signs, because each of the 7 miracles are “signs” that Jesus was the Messiah. Performing miracles was one of Jesus’ four main teaching methods in an attempt to convey spiritual Truth to twelve ragged disciples who had absolutely no way to relate to that experience. For beginners, this class is a good introduction metaphysical Bible study, and for those who are already well versed in the Bible, it is an opportunity to deepen your understanding. The intended outcome of this course is for students to understand the spiritual laws that give rise to so-called miracles and apply those laws to create miracles in their own lives. Week 1: Introduction to the miracles and the role of metaphysical Bible study in understanding and creating them. (John 1:1-18); (Matt. 1:1-16); (Luke 3:23-38). 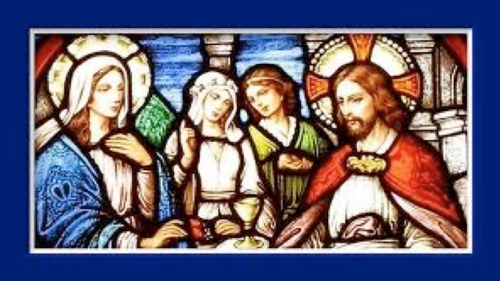 The First Miracle: The Wedding at Cana (John 2: 1-12). Week 2: Discourses: Nicodemus (John 3:1-21); the Samaritan Woman (John 4: 1-39). Week 3: Healing of the Official’s Son (John 4:46-54); the Lame Man at the Pool of Bethesda (John 5:1-18). Week 4: Feeding the 5000 (John 6:1-14) (Matt. 14:13-21); (Mark 6:30-34); (Luke 9:10-17). Discourse on the Bread of Life (John 6:22-40). Week 5: Jesus Walks on the Sea (John 6:15-21); the Man Born Blind; (John 9: 1-12); Discourse on the Light of the World (John 8:12-20). Week 6: Raising of Lazarus (John 11:1-44) and other resurrections; Jairus‘ daughter (Mark 5:21-43, Matt: 9:18-26:), (Luke 8:40-46) widow of Nain’s son (Luke 7:11-17). Classes start on April 4, 2013, which is the first Thursday after Easter. Go here for the schedule and go here to watch the live stream broadcast. Here are some of the lesson materials. Eleanor will add to this list as the lessons go on. Lesson syllabus, Introduction and What is a miracle? You may download a PDF copy of Mysteries of John at our pubs/books page.